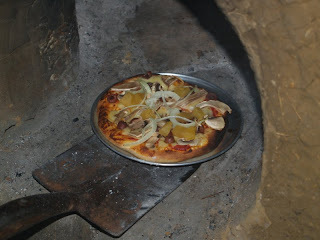 How else can you describe pizzas cooked in an oven you built by sheer physical labour and mud (plus just a little straw and sand)? We had a great day on sunday to celebrate our daughter's second year. The weather was pretty good for August in this part of the world, the food was great and so was the company. Unfortunately 'granddad' couldn't make it, so I hope he likes the photos. Our little girl is not real used to crowds so at one stage she was a little overwhelmed by it all, but she did enjoy her self, and loved taking her cousin to see the animals. Now we are looking forward to her second birthday in only a few weeks. 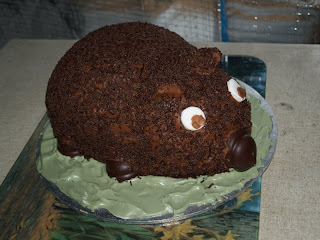 Brad being the perfectionist that he is made her just a fantastic birthday cake - a wombat. 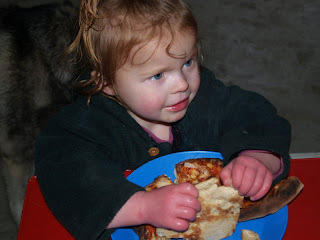 She just couldn't quite believe her eyes in the morning when we showed it to her, she then tried to pat and kiss it! I didn't quite finish her top that I'm making her, but its not far off being finished. Well, its lovely day here today - first fine day in ages, so I'm madly washing clothes, tomorrow I'm planning on planting out as many trees as possible as I'm worried that spring is here, and the poor things wont have time to get their roots in the ground before summer comes. We are planning an extravagant vegy garden/greenhouse/chook tractor system. No doubt we will start on that before we finish off some of the other started jobs! Ah the joy of being dreamers! the wombat birthday cake is way to cute! love it! Looks like the party and the pizza were a hit!! LOVE the wombat cake! I would have tried to pat it too!! All fired up... well sort of..